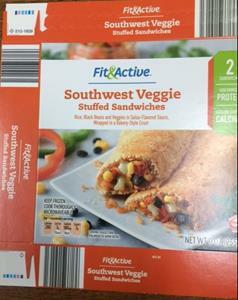 PENNSAUKEN, N.J., Oct. 29, 2018 (GLOBE NEWSWIRE) -- J&J Snack Foods Handheld Corp. of Holly Ridge, NC is voluntarily recalling two lots of Fit & Active Southwest Veggie Stuffed Sandwiches due to potential contamination with Listeria monocytogenes and Salmonella. Salmonella is an organism that can cause serious and sometimes fatal infections in young children, frail or elderly people, and others with weakened immune systems. Healthy persons infected with Salmonella often experience fever, diarrhea (which may be bloody), nausea, vomiting and abdominal pain. In rare circumstances, infection with Salmonella can result in the organism getting into the bloodstream and producing more severe illnesses such as arterial infections (i.e., infected aneurysms), endocarditis and arthritis. Products were distributed between 08/22/2017 – 09/20/2017 to Aldi retail stores in Alabama, Connecticut, Delaware, Florida, Georgia, Kentucky, Massachusetts, Maryland, Mississippi, North Carolina, New Hampshire, New Jersey, New York, Ohio, Pennsylvania, Rhode Island, South Carolina, Tennessee, Virginia, Vermont, and West Virginia. Product was also available for purchase to ALDI customers in the Atlanta area through the company's partnership with Instacart, a grocery delivery service.